On Tuesday morning I awoke early in the morning to find the ground, trees and cars ouside totally covered with rime. Given that this is not a common weather phenomenon and created a beautiful spectacle I decided to take some pictures. Some of them came out quite nicely. I carried my camera with me to campus later in the day and took a few more pictures. If you are wondering what “Rime” is then I found a Wikipedia page offering a good explanation with some pictures bearing a resemblance to my own! Over the weekend I stayed with Heather and her family at their house in Middlesbrough. It was a special occasion for two reasons. Mainly because Heather’s sister Claire is soon to travel to Australia for the year and so was having a farewell party, but an added bonus of the weekend was that I got to meet the rest of Heather’s family who I had not yet had the fortune to meet. All in all it was a very enjoyable weekend and while I now have a huge quantity of work to catch up on I had a great time and look forward to staying with Heather’s family again soon (hopefully during the Easter vacation). This weekend has meant that I’ve now met all of Heather’s immediate family and she has met all of mine. Considering we’ve been going out for well over a year now, its taken quite a while! I had a quick hack around today with Calendar for WordPress and I have fixed some of the long standing bugs that while weren’t serious, were causing some people issues. I’ve also tightened up some of areas I considered sightly weaker than they should be on the security front and also introduced a few new features. One of the most notable changes is in the way the links work on the new version. Personally I much prefer the clean URL structure that currently ships with Calendar, however this requires a modification to the .htaccess file which many users were having issues with. This was due to the vastly differing ways in which people had chosen to setup their blogs and permalink structures already chosen. The new version will provide standard arguments-in-a-url style operation and nothing else. It will install and work on any blog configuration out of the box (even MU as I’ve had requests for it to work on that too) and without edits to the .htaccess file. Clean URLs however will only be possible with a code edit to the plugin file and the addition of lines in the .htaccess file. Because of the support time that .htaccess issues have consumed in the past, users making such changes on their own will have to choose to do so unsupported. Below I have listed all the modifications made so far, but this is not an exhaustive list of everything that will make it into the next release. Fixed the bug in the admin screen that would cause IE users to not see the dates, times etc. in add/edit event the form. Allowed the week to start on a Sunday. Users who have their WordPress options set to Sunday as the starting day of the week will see the calendar obeying the setting. A release will be made in the next few days both here and on the WordPress plugins repository. If anyone has anything in particular they would like to see in the next version then shout in comments. I got my semester 1 exam results today and I was pleased with the outcome. I continue to do well in Leeds School of Computing and obtained a 1st average in the latest round of exams. Its suddenly become very plain to me how close I am to graduation and how very close I am to obtaining a first overall. It motivates me very much to think that I could be standing in the degree ceremony at the end of the year with a first grade piece of paper with my name on it. While this is a great result, it was slightly tinged by a particularly poor grade in one of my modules. While this didn’t affect the average too much it did leave me the closest to the 1st grade boundary I have ever been and it woke me up to the idea that one single bad module grade in the next round of exams could tip the balance. While I don’t feel I could have done any better in the module it makes me more resolved than ever to work extra hard so I don’t risk letting slip what is nearly in my grasp. Today I setup a new router in our house, the Netgear DG834G. After carefully ensuring all existing settings were mirrored on the new device it was just a question of unplugging the cables from the old router and plugging them into the new one, like for like. It worked straight away with no noticeable problems. I’ve known for years that I really should have replaced my old Origo (more modern requirements were taking their toll on its memory and other capabilities) but today, when I got an extra 100 Kb/s download speed simply by changing my router, I wish I had done it sooner! I did hit one snag though in that my ability to connect to remote VPN networks using PPTP suddenly stopped working. After a bit of experimentation I realised that for some reason having DMZ enabled to any IP caused authentication to fail. Disabling DMZ allowed the connections to happen flawlessly. Having to implement this work around didn’t fuss me as I don’t actually use DMZ, in fact it was merely pointed at a non-existent IP on my subnet in order to shield unused ports. Turns out that the Netgear doesn’t need such a thing to ensure all risky ports but the ones forwarded are hidden. Times have changed since the Origo days but old habits die hard! Recently we have had some high winds here in Leeds and it has caused many bins that were left out on the street after collection to be knocked over onto their sides. In some cases they have been pushed along the street during particularly strong gusts, impacting with passing cars! The point of this article though is to comment on what I saw when I happened upon a bin that had been knocked over when I was returning home from the shops one morning. As I glanced at it I noticed that against the green background of the bin there was a solid, circular, black disc under the lip of the bin, completely unnoticeable unless the bin was on its side as in this case. The paranoid cynic in me thought “Good Lord, thats an RFID chip that is! The bastards are tracking what we throw away!”. I dismissed the notion as absurd but when I got home I couldn’t resist the temptation to do a little googling. To be frank I was shocked with what I found. Turns out I wasn’t paranoid at all, they really *are* planning on tracking what we throw away, how much and how often and storing it all in a central database! The installation of a chip is an indication that they are either doing it already or planning on doing it in the near future. I also inspected my own bins and found chips to be present on both of them. I have collected some links on the issue and have made some brief comments on them. It turns out that this been around for some time but unlike many things of this nature this one seems to have slipped under my radar. “Is your bin bugged?” – A quick blog post from someone who felt compelled to check their bin for a bug and after not finding one, found some pictures off the internet showing what the bug looked like, where it was situated and what it looked like after a removal. Removing the bin bug – A quick how-to for removing the bug. “Another day, another bin bug” – A writer removes another bug after a replacement bin was delivered to replace one he had previously removed a bug from. Does your bin have a chip? Did you know your waste disposal habits were being tracked? How do you feel about this? If you have any comments on this article or the links I’ve provided on this matter then please leave your comments below – I’d be very interested to read them. Any Hyde Park resident in Leeds will have noticed that it has become almost impossible to walk down a pavement recently. This is due to lamp posts being replaced and the area surrounding old posts being dug up to make way for the new ones and the associated cabling. This has resulted in barriers being placed around these areas meaning the only way to get passed is to walk into the road. Normally this wouldn’t be a problem as it would only have been short term but unfortunately it seems that the work was started just before the recent high winds and hasn’t been resumed since. The work was presumably stopped because of the risks of the posts falling in the wind as they were erected. What I want to know is when are we going to get our pavements back? Taxi drivers and others drive damn right dangerously and I can’t be the only one who feels nervous arbitrarily stepping into the road ever few paces without knowing if I’m going to get mowed down, particularly at night. If there was going to be a delay in completing the work, why was it started and why could they not make good the pavements with some special boarding or something? To think the price some are paying in council tax it is shocking that the council get away with this type of thing. Council tax payers see no value for money what so ever. Since coming back to university after the Christmas break and completing my January exams I’ve had plenty of time to continue my experimentation on the reading roadsigns project and thought I’d post a quick update on whats been going on. 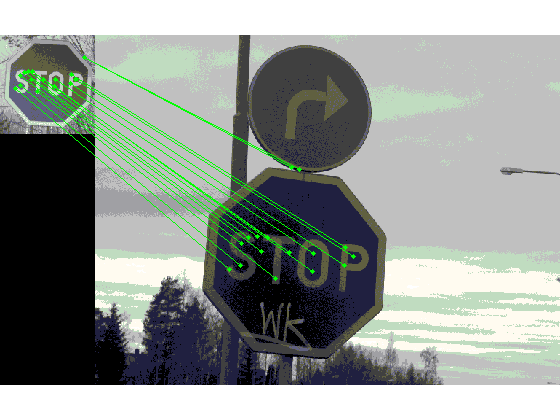 Recently I’ve been running a number of experiments in Matlab using SIFT and attempting to get various roadsigns recognised by using a cropped training set for a particular sign and then matching it against keypoint descriptors found in a test image. I’ve been gathering statistical data and dumping this out to a file for analysis and further work but I’ve also been generating match images for each roadsign tested against the most favorable image from the training set. To give people an idea with how this is progressing I include an example of a very successful result on a STOP sign below. Its not all rosy though and I’ve been given food for thought after my interim report and some failures of the SIFT algorithm in recognising certian signs. In my initial experimentation with actual roadsigns I decided to go for a simple sign as this would be less likely to be susceptable to noise. This was in fact quite an unwise decision as SIFT works by finding particularly unique points and I had effectively removed the possiblity of it finding such points by using a simple sign. I include below a matches image for a No Entry sign. As you can see, its actually quite noisy. This is a problem which got me thinking about how I can make the whole process more robust and forced me to return to some of my early research on object recognition. If I can use SIFT as a pre-processor then I can identify signs quickly and easily that have many descriptors such as STOP signs and then use a more basic system such a a template or colour match to identify the simpler signs such as the No Entry sign. I could also do it the other way around and will need to perform tests to decide what the best order is. 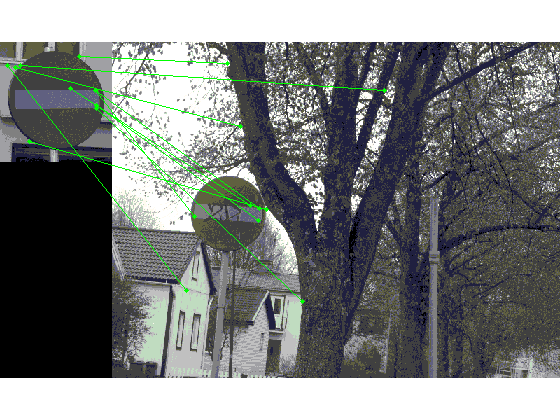 I’m currently working on an idea that SIFT could be used to detect the presence of any sign (not which one it is, but where it is) and then further tests could perform the recognition. In addition I’m researching examples of where SIFT has been modified to be used in colour and also how best to display experimental results. I’m also in the process of writing code to fully automate my training and testing process in Matlab so I should be able to run batch jobs and get results and test theories quicker. Watch this space for more updates – its all go!